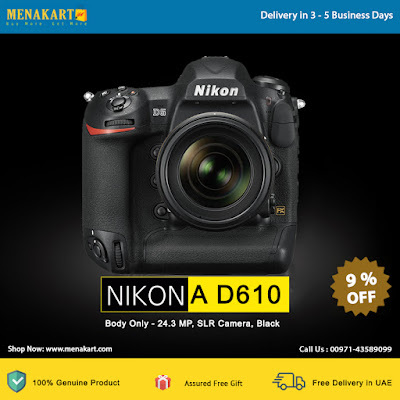 Nikon's D610 DSLR Camera is a pro level DSLR camera that is quite easy to use. The camera can capture mesmerizing full frame images, and broadcast ready 1080p videos. Its superior low light performance, fast frame rate of up to 6 frames per second, ultra sharp autofocus, built in flash with Commander Mode helps shoot awe inspiring photos. Wireless photo sharing is possible by attaching an optional WU 1b wireless mobile adapter. Nikon D610’s continuous quiet mode lets the user shoot a sequence of continuous photos minus the noise that accompanies the rising and lowering of the DSLR mirror. Made for full frame photography, the compact, light weight D610 by Nikon is sure to immerse you in photography like never before. The Nikon's D610 DSLR Camera is made for passionate photographers who seek full frame, high resolution quality images every time. The D610's 24.3 megapixel FX format CMOS sensor records even the tiniest detail with superior sharpness and low noise throughout its wide ISO range. Low light performance is possible as the camera shoots crystal clear images from ISO 100 to 6400, further expandable down to 50 and up to 25,600. EXPEED 3 processing system ensures images are captured with remarkable speed and accuracy. The camera also faithfully reproduces true to life color images. The D610 features the best AF coverage, thereby offering the user endless compositional possibilities. Multiple sensors, focus points on the camera, when combined with teleconverters and long reach lenses allow for compositional freedom. Scene Recognition System's subject identification and tracking information offers enhanced performance by 3D Tracking and Auto Area AF. The Nikon D610 is capable of consistently delivering beautiful images with the intelligent Scene Recognition System with 3D Color Matrix Metering II. Its RGB sensor takes into account every scene, its brightness, contrast, distance and colors in an instant. The gathered data is then referenced against an onboard image database for perfect exposures, auto white balance, i TTL flash and subject tracking autofocus performance. The Nikon D610 allows the user to shoot both 1080p, as well as 720p HD videos. The camera also has dedicated inputs for stereo mic and headphones. The Nikon D610 allows the user to wirelessly transfer photos to your tablets, smartphones, or other compatible WiFi devices. The adapter also lets you remotely control your camera, allowing you to shoot from your smartphone or tablet.